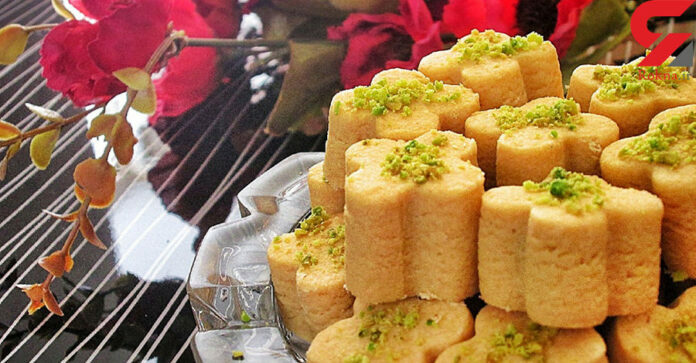 Made of chickpea, the cookie is usually in circle or four-petal flower shapes and garnished by pistachio slices. First mix the sugar powder with oil using an electric mixer. Now add cardamom and vanilla. Then it is the chickpea’s turn. Add it gradually. If you feel the dough is relatively drained, simply oil your hand and knead it more. Make sure the amount of oil is enough. If it exceeds the normal level, you can add some further chickpea to make a balance. Having kneaded the dough, roll it out with a rolling pin on a flat ground. Then, mold the dough into circle or four-petal flower shapes. Now put the molded pieces into an oven with a 375 Fahrenheit temperature for about 21 minutes. Then take them out to cool down for 15 minutes. Now, place them neatly into a dish and garnish them with pistachio slices.